3:1 We got to the point where we couldn’t take the suspense any longer. We decided to stay alone in Athens. 3:2 We sent Timothy—our brother and colleague—back to check on you, encourage you, and strengthen your faith. 3:3 We didn’t want the troubles you’re going through to destroy your faith. You know it’s a given that we’re going to have to suffer because of what we believe. 3:4 When we were with you, we told you it would happen—that persecution was coming. We were right, as you can see now. 3:5 I, Paul, got to the point where I couldn’t take it any longer. I decided to send Timothy to see if you were still hanging onto your faith. I was afraid that the tempter had done his job, tempting you so effectively that our work with you was wasted. 3:6 Timothy just got back. He brought with him good news about your faith and your love. He said you still think of us kindly and that you want to see us again, just as we want to see you. 3:7 Dear family, though we’ve been experiencing agony and trouble, we are so incredibly relieved and encouraged to hear this news about your faith. 3:8 We feel all the more alive now that we know you are alive in the Lord. 3:9 How can we possibly thank God enough for you? We’re so happy because of you that we don’t know how to adequately express our joy to God. 3:10 We pray constantly, night and day, that we’ll get to see you again and teach you more about the faith. 3:11 I hope that our God and Father along with our leader Jesus, make it possible for us to visit you again. 3:12 In the meantime, may Jesus help you grow stronger in your love for each other—and for everyone—just as our love for you grows. 3:13 May Jesus make you into strong people of faith—so strong that when he comes back with his followers, you will find yourself standing blame-free in absolute devotion before our God and Father. 1. In Athens, about a 300 mile (kilometer) walk south of Thessalonica (longer by sea), Paul sends his colleague Timothy back to Thessalonica because he was afraid “the tempter had done his job, tempting you so effectively that our work with you was wasted” (3:5). When parents send their kids, who are freshly grown up, off into the world, parents worry like that. They are afraid their kids will give into temptation and make all kinds of bad decisions. Where do you think that worry comes from? 2. When Timothy returned to Paul with the good news that the people in Thessalonica were hanging on to their faith, Paul was overjoyed. Happy enough to bust. “We’re so happy because of you that we don’t know how to adequately express our joy to God” (3:9). When have you been that happy for someone, or when have you seen someone else that happy for another person? 3. 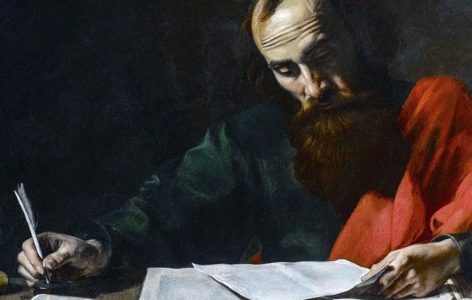 Paul often includes prayers in his letters that sound like a benediction that a pastor might use to finish his sermon and send the people on their way. In fact, many pastors quote Paul in this very manner. Paul ends this chapter with a blessing. “May Jesus help you grow stronger in your love for each other—and for everyone—just as our love for you grows. May Jesus make you into strong people of faith—so strong that when he comes back with his followers, you will find yourself standing blame-free in absolute devotion before our God and Father” (3:12-13). What’s the point? What good do you think these words do? 4. LIFE APPLICATION. As Paul continues his mission trip, traveling into what is now southern Greece, he starts worrying about the people he left behind. He’s afraid that the new believers he left in Thessalonica might not be able to survive the onslaught of criticism, harassment, and persecution he knows they are already facing. “We couldn’t take the suspense any longer…We sent Timothy—our brother and colleague—to check on you” (3:1-2). When was a time you felt compelled to do that for someone, or when someone felt compelled to do that for you?